This Is Solo Hiking For Me course is moving to a new software platform with enhanced learning features. Are you intrigued by the idea of solo hiking? But also uncertain about whether it's right for you? It's a big beautiful world out there, and going solo gives you the freedom to explore it. Facts and emotions go into making a decision about solo hiking that's right for you. 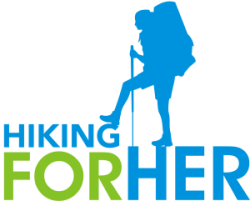 This course guides you gently but with a bit of tough love, showing you how to use both your head and your heart to make a hiking decision from a position of strength. Do you ever daydream about being fully in charge of your hiking plans? Are you curious about what it would take to get into the solo hiking groove? Change doesn't come by daydreaming or wondering (although these can be precursors and catalysts for change). Change happens by getting crystal clear about your motivations, current reality, and goals. So if you're looking to shake up your hiking routine by going solo (or just want to try on the idea in the comfort of your home), this is the course is for you. It will change the way you think about hiking, and it just might change the way you think about your whole life. Is Solo Hiking For Me course designed to do? I get lots of email from female hikers all over the world. And the number one topic? "Am I crazy to want to go solo?" "Will I need different gear?" "What do other women get out of going solo?" "How do I keep myself safe?" "Is it too hard for me?" It wasn't long before I realized that I needed to create a guided, structured experience for women like you to safely and methodically explore those questions. In my mind, you're being really smart to think through what solo hiking really means before you set off alone! to give you a structured process to arrive at a satisfying answer to the real world, non-trivial hiking question tugging at you. Make a decision about solo hiking from a position of strength and confidence. A combination of 45+ years of hiking experience AND a masters degree in teaching are behind the course content. It would be my pleasure to work with you to get a satisfying answer to your burning question: to solo, or not to solo. Sometimes it's easier to work one on one with a coach or mentor. Hiking For Her's Metamorphosis approach might be just what you need. Taking a self-paced e-course is so fast and easy! You take one step at a time. You decide when to take a rest break, and when to push onward. You keep track of where you've been and look to see what's coming up next, using a simple check off system. Sounds a lot like solo hiking, doesn't it? And here's the best part: you can return to the course material again and again at any time, just like a favorite hiking destination. Once you access the materials, they're yours forever. First, the intangibles: your precious time and attention. To maximize your time, each lesson is kept brief and succinct. But don't be fooled by brevity! Every section of the course has been carefully designed to highlight and explore a critical concept or question. I've used all of my teaching best practices, combined with my own process of transitioning into solo hiking and all of the email questions I've gotten, to design each phase of the course. And I provide lots of options for further exploration if you have more time and want to go “off trail”. The third cost, of course, is the monetary investment. Free advice and opinions are great for whetting your appetite, surfacing questions, and pointing in a particular direction. The blogosphere is a seductive tool for Q & A. But when you need guidance on a serious topic such as solo hiking, purchasing a course by a trusted expert makes sense. And when money enters the equation, suddenly the learning becomes “real”. Your decision to explore solo hiking becomes reinforced, and can provide motivation when life gets extra busy or you'd rather clean the bathroom (ok, I jest). On my end, your purchase is a signal to me that you're serious about this topic, eager to do the work to get to the heart of the matter. It's a sign that you are going to use the tools and techniques I offer. Teachers love motivated students! If you're ready to explore the “solo – should I or shouldn't I” landscape, I'm here for you. Immediate, unlimited access to course materials. Self-paced lessons and activities to explore and enjoy. Audio, video and pdf downloads, carefully selected to focus your time and attention. A personal Q & A phone session with me, at whatever point in the course makes sense for your learning but within 6 months of purchasing the course. Just hit the “Email me” link to schedule it. Bonus materials so you can really dig into an idea or go in a new direction. Insider invitations with special pricing. A few surprises, just to keep things spicy. The course costs $39.95, which works out to a great deal per lesson (not even counting the bonus materials and phone call). It's convenient, comprehensive and thought provoking. Don't be surprised if some of the lessons change the way you think about other facets of your life: career, relationships, food, finances. And don't overlook the personal Q&A call, which is a $60 value (double the price of the entire course!). That's how serious I am about helping you gain clarity around whether or not soloing is right for you. You'll have 30 minutes to ask me anything! Lots of women ask what they apologetically label “silly” questions – believe me, no topic is too trivial or weird or “silly” to bring up and discuss during our private session. Q&A is the best part of teaching, and I relish it. I get lots of emails from female hikers who pay big money for tricked out packs, the trendiest colored jacket (citron is hot right now, if you're into hiker fashion trends), or expedition grade tents they don't really need. Why? Because they equate high end gear with guaranteed hiking success. But in my opinion, what's in your head is way more important than what's in your pack/on your back. This course gives you an opportunity to get clear in your mind about the kind of hiking you'd like to do in the future. When's the last time you gave yourself some space to reach into your own head and focus on yourself? 1. What is my weekly time commitment? The answer depends on your learning style (and might give you a glimpse into your solo hiking style). A “get-in-and-get-done” approach will likely require an investment of 1-2 hours of time per week. $2.50 per lesson (see above) divided by 2 hours is pretty great math, don't you agree? A “savor-the-experience” mindset could easily immerse you in 3 or 4 hours of discovery and learning each week, with the bonus material opening up even more avenues for exploration. Most people will give themselves at least a month to work through all of the course material. But if “overachiever” is your middle name, and you can devote concentrated amounts of time, you can arrive at your Solo Hiking answer within just a few weeks. Maybe in time to get in a solo hike before the season turns! 2. Do I have to be computer savvy to take this course? Great question! Short answer: No. I chose the course hosting company (Ruzuku) because they make it easy to get started with my materials. Open up the course page. Create a short profile using the easy to understand directions. A photo is optional but highly encouraged so I can have a face to attach to your name. Phantom students creep me out. Click on the first step of the course. You're rolling! Think of each section of the course as a literal step along the way to answering your burning question about whether solo hiking is right for you. Within each step you'll find a wealth of activites focused on a particular learning outcome. Bonus materials can be viewed later; think of them as optional enrichment activities. Time will fly as you read the material and click links to videos, audio files, and pdf downloads of checklists, worksheets, and other learning aids. Remember, this course is all about you. You set the pace and time investment. Solo hikers like the element of control, and you'll enjoy full control over your learning. Pay attention to how that feels; it's a clue pointing toward your interest in soloing. An independent, motivated learner makes a great solo hiker. 3. What if I have trouble anyway? Here's where the hosting company sets itself apart from the others I investigated. They are wizards at sending fast, friendly, and effective answers. I've been consistently impressed with their response to my own glitches and “Help! !” questions as I built this course. I don't rely upon folks I can't trust to get the job done (another Hiking Best Practice - are you taking notes?). 4. Do I have to do each step in order? OK, here's a little bit of teacher tough love. I predict that a “nibble a bit of everything” urge will come over you when you look at the course layout and see all of those tantalizing links. Small, fast bites – what's the harm? My teacher's heart urges you to resist the urge! I developed this material in a specific way, pouring all of my hiking AND classroom wisdom into it. I want you to get the absolute most from this course (my highest hope for you). Trust me and do each lesson in sequence. See this as a dance between you and me. Give it your time and attention, to match the time and attention I gave it. Sit with the ideas and questions for awhile, allowing yourself space and time to process them. Don't worry! I won't be there to Tsk! Tsk! if you skip around like a snowshoe hare chased by a fox. But you'll do it to yourself when you max out all of the learning opportunities in a jumbled, random order and you still don't have a confident, coherent answer to your burning question. That's our bottom line, right? Getting you to an answer you can live and hike with. Solo hiking is for you if you crave solitude and silence. 5. How do I schedule my Q&A phone call with Diane? On the main course page you'll find my photo. There will also be an “Email me” link which takes you to my email address. Send me 3 days and times of day, along with your time zone, that work for you. I'll get back to you with a confirmation email, or suggest alternate dates. I recommend that you do at least the first half of the course before we chat. Keep track of your questions as they arise, and have the list ready to go when I say “Hello”. 6. What specific outcomes will I achieve if I take this course? You could surf around and read lots of blogs and articles about how to solo hike. That's great information, but don't you want peace of mind around whether or not solo hiking is right for YOU? Lay to rest the whole issue of “should I or shouldn't I” so you can plan your next “career move” as a hiker. 7. Is there a refund available? Let's use the analogy of opening a new box of cereal. You pour a bowlful, eat half of it, and then try to return it to the store because it's too crunchy, or not crunchy enough. Same idea here: once the course materials are delivered instantly to your in box, there's no way to “take back” the brimming bowl. Some things just aren't “returnable”, right? A great way to scope out the course ahead of time is to skim the hundreds of pages of free hiking information I provide on this website. Just use the navigation bar at the top left of this page. “Try on” my style (my sense of humor is a little warped, I'm the first to admit) to see if it's right for you. I am very confident that the course design, along with the private Q&A session with me, will bring you to a decision that feels good. Keep in mind that a private 30 minute Q&A session with me outside of this course costs more than the price of this course, so I think you can see that I make this course not only easy to access and use, but affordable. And finally, because your learning outcomes are uppermost in my mind, I have one more way to reassure you that this is a wise investment in yourself. Let's run this scenario: You purchase the course. You work through the materials. You have your personal chat with me. And you decide that you haven't accomplished the learning outcomes. You will send me the work you've done to complete the course: your answers to questions I posed, your filled in worksheets, your reactions to videos and audio clips, any musings and Aha! Insights you recorded. All of this information will help me spot where you're still “stuck”. Then I'll give you even more suggestions and recommendations to work with (sort of an individualized “office hours” approach). If the “office hours” approach doesn't "unstick" your stuck spot, and you truly believe that you weren't given a fair chance to consider all sides to the “Solo Hiking” question, you can choose any other instant download course I offer free of charge. That gives me AND you a second chance, right? This guarantee of extra time and attention on my part demonstrates that I'm fully committed to your process. If you're serious about exploring solo hiking, I'm serious about helping you. 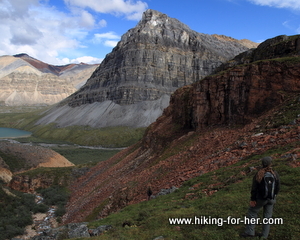 I want you to taste the freedom and adventure of hiking, and (possibly) going it alone! 8. How can I get the most out of this course? Don't play the “I'll do it later” card on yourself. These are all signs that solo hiking might not be for you. It takes mindfulness, patience, attention to detail and stamina to be a safe and confident solo hiker. Pay attention to not only WHAT you're learning, but HOW you learn! Take notes on your reactions to the lessons, if you are the aforementioned overachiever. My best advice: Relax into the process and trust your experienced trail guide (that would be me!). Why defeat the underlying “master design” that I worked hard to create for you? My prediction for you: Facts (brain) and emotions (heart) will come together if you stick to the trail and give it your all. And nothing is more satisfying than that! (Yet another Trail Truth). 9. Do you have any other hiking courses? Oh yes! I love designing and teaching them. Here's the page to check out. If you don't see what you're looking for, send me an email proposing a topic and I'll tackle it! 10. I still have questions. How do I reach you? Expect an answer within 24 hours. Caveat: unless I'm out on the trail! Rest assured that I will return your message within 8 hours of turning on my computer. If you don't hear from me within a few days, please send your message again. Gremlins probably ate it (the same ones that make you forget to take your lip balm out of the front pocket on your hiking pants on laundry day). This course is moving to a new software platform with enhanced learning features.